Just a reminder that myself and Inbetweeners co-creator and all-around Hollywood fancy pants Iain Morris will be taking to the stage this Friday night at the John Lovitz Podcast Theater. It’s going to be a Space Monkeys show unlike any that has ever come before. Plus, since I’m not sharing a hotel room with him, I can confirm that Impractical Joker Sal Vulcano will be coming up on stage too. Basically, me and two of the funniest human beings alive will be giving our all to amuse you. Both Iain and Sal have already given some hints on how they intend to sandbag me up on stage, so I can tell you it’ll be fun. THIS FRIDAY! Come on down. We’ll be hanging out and drinking afterwards. It’ll be a blast. Click here for tickets! So any fan of TESD knows how much I love The Inbetweeners. It can’t be a mystery to anyone that I adore that show and, after he bought me endless rounds of alcohol in London, I also adore Iain Morris, the co-creator and writer of that show. So I have a classic bad news/good news situation on my hands here that I need to report to you. Space Monkeys has a live show set up for Friday, January 20th at the John Lovitz Podcast Theater in Los Angeles. Originally it was supposed to be, as always, Bryan and I but due to Comic Book Men reshoots Bryan has to drop out. The good news is that my friend and personal hero Iain has agreed to step in to take over for him. He’s going to bring a touch of that old British class to the Space Monkeys. Pip pip, cheerio! If you’ve seen the Inbetweeners you know that this man is an absolute genius of comedy and I feel honored to share a stage and talk with him. If you haven’t seen the Inbetweeners, come down to the Lovitz and meet the man who co-created what will one day be your favorite show as well. As always, I’ll be hanging out and drinking after the show. Also, I’ve got Impractical Joker’s Sal Vulcano about 80% convinced to take the trip with me, so we’ll pull him up on stage for a bit too. Jesus! THREE titans of television comedy! What more (besides maybe Bryan and Walt) do you need? I’m also thinking up some Impractical Jokers give-a-ways and more cool stuff. All you gotta do is show up! Please come down and hang out. It’ll be a blast. P.S. follow me @BQQUINN for behind the scenes updates on all this fun. I know he needs it to look pretty good, so please only contact Walt about it if you know you can make it top notch. I know it’s for a pretty exciting project, so you’ll be happy to have been a part of it. 1) With only 4 days left to order the TESD Vinylcast, Walt has dropped an awesome new wrinkle. 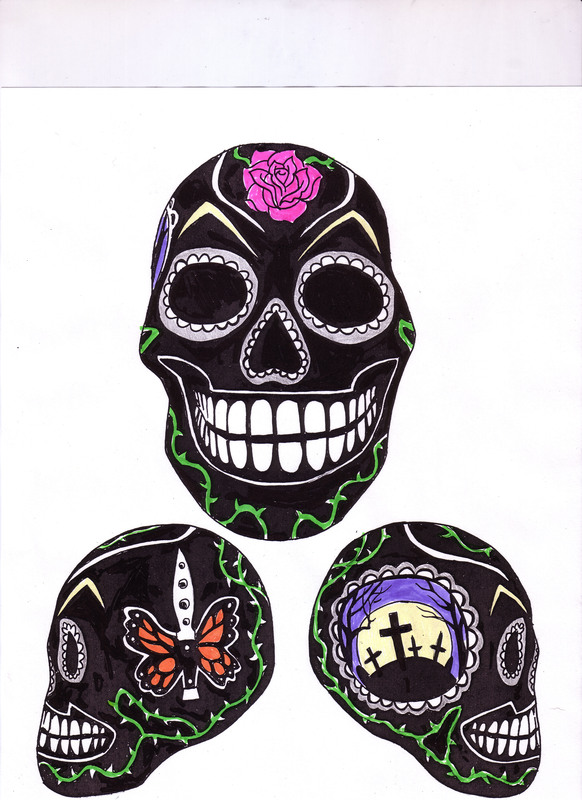 He’s going to give away the original penciled artwork that he drew for the album cover. That makes me wish that I was eligable to win it. Alas, I am not. Only those who order the TESD Vinylcast can win. So that means if you order the album you can win one of the 100 colored vinyl records, or the signed record player, and now the original artwork. Again, we hope this goes to show how truly appreciative we are that you guys turned out in such force to support this idea. ORDER THE VINYLCAST HERE!!! TIME IS ALMOST UP!!! 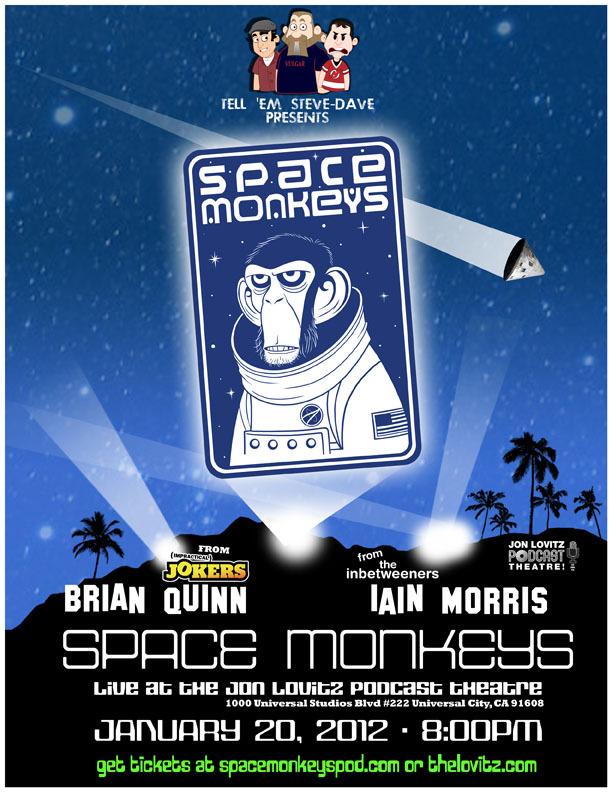 2) Bryan and I will be taking Space Monkeys on the road once more, this time to Los Angeles. On January 20th we will be performing at the John Lovitz Podcast Theater. This is the start to what I aim to make a solid year of touring for TESD / Space Monkeys. If you live in the area, please come down. Ask anyone who went to our England shows and they will tell you that Bryan and I go all out to make it as fun an experience as possible. That’s all for now. Thanks for reading. Happy New Year! So, yeah, the vinylcast has done well. I’ll never be able to show my full appreciation for the support of our listeners on this, but I kinda figured I’d try. This week I’m going to purchase one of those all-in-one Crosley record players and get it signed by Bryan, Walt and myself. When we ship the Vinylcasts, we’ll randomly choose an order and send the player out with it. A TESD Edition Record Player. Don’t worry if you don’t live in the United States. ALL orders will be eligible to win the turntable. I’ll ship it to the Congo if the winning order is from there. So, around a hundred lucky people will be getting the colored vinyl version of the disc – I’m thinking it’s gonna be in red in honor of Walt’s beloved New Jersey Devils – but one super-lucky person is going to win the record player. Hell, one person may even get both! Hopefully the colored vinyl and the signed record player will go a little ways towards showing our appreciation to you guys for your support. It is truly inspiring. I only started the vinylcast project because I wanted to own one of them myself. This is the mandate that dictates everything we do here at TESD and, because of the success of this, I’m confident that 2012 will see some pretty cool ideas coming to fruition. If you haven’t ordered the Vinylcast yet, you have until January 7th to do so. After that the discs go to press and no more orders will be taken. Click here to order! Thanks again! Thanks so much! The band at the end of today’s show are friends of ours & for those of you who’re so sharp-eyed you make an eagle look like Mr. Magoo, you’ll notice that one of the two members of ‘ The Ribeye Brothers’ is Jon Kleiman…a gentleman who contributed to the musical portion of one of America’s best loved films, Vulgar. Check out their MySpace page…our boys are fairly dope as the kids say these days.